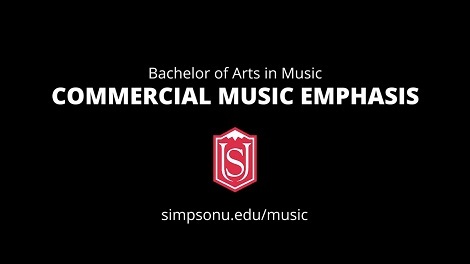 Simpson University's Music major is designed to provide professional preparation for a number of musically related professions: composition, performance (voice, piano, or another instrument), and worship ministry. You can also receive a Music Liberal Arts Emphasis degree. This major is designed for students who would like to pursue a music degree but are not seeking preparation for the music professions of performance or church music. A professional degree designed for students with strong theoretical and compositional skills who wish to become professional composers or theorists and continue their education at the graduate level. A professional degree designed to prepare students for K-12 music teaching in choral, instrumental, and general music areas. Student teaching and CA state certification programs are administered separately, though Simpson's School of Education. A professional degree designed for students with strong performance skills who wish to become professional musicians, college and university teachers, or private studio teachers. 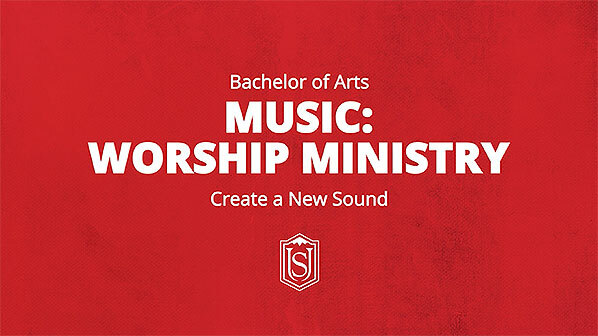 A professional degree designed for students who wish to assume positions of leadership as musicians in the Church and to continue their ministry preparation at the graduate level. A professional degree designed for students who would like to pursue a music degree with a broader liberal arts emphasis and more elective options. The commercial music emphasis prepares students for careers in the music industry such as recording engineer/producer, tour manager, artist/performer, and songwriter. Artistic Synthesis: Students will be able to relate a wide range of music proficiencies to a culminating or capstone artistic endeavor. Performance Skill: Students will be able to perform (on their chosen instrument) at professional level. If you have any questions or you want to learn more about what our music department has to offer, please contact (530) 226-4507. Directed by Dr. Steve Kim, is an auditioned mixed ensemble specializing in advanced vocal and choral techniques and standard choral repertoire. Chorale is the touring vocal group of the university and travels in the U.S. and abroad. Past tours have visited England, France, Germany, Belgium, Spain, Switzerland, and West Africa. Directed by Dr. Steve Kim, is a community chorus sponsored and hosted by Simpson University. It is open to all Simpson students, faculty, and staff as well as community members. Repertoire includes a variety of chorale literature, but focuses primarily on the performance of large scale choral works. Trinity performs in conjunction with the Shasta Symphony Orchestra and Chorale. The Shasta Symphony Orchestra is a collaboration between Shasta College and Simpson University and is conducted by Jeff Specht, assistant professor of instrumental music at Simpson. It consists of students from both institutions, as well as musicians from within the community. The mission of the Shasta Symphony Orchestra is to help students reach their artistic and educational goals by providing them with a challenging and successful performance experience, and to contribute to the overall enrichment of the arts programs within the Redding community. Directed by Cleveland Bonéy, is open to all Simpson students by audition. The Jazz Consort performs on a regular basis throughout the year, and tours across the West Coast. Directed by Ruth Polcari, is comprised of Simpson students of any major. The group performs a variety of quality repertoire, from traditional band music, to twenty-first century compositions, to the classic chamber wind music of Mozart and Beethoven. Directed by Dr. Dwayne Corbin, is open to all students. PE performs classic percussion literature, world music, and mallet ensembles, as well as combines with other instrumentalists or vocalists to present percussion-oriented twentieth-century masterworks. Directed by Lois Nichols, consists of up to 11 students ringing a three octave set of handbells. Open to Simpson students who have no prior handbell experience. Performance opportunities include a small ensemble concert, chapel, and local church functions. Auditions are required for admission into all ensembles. Auditions are held during Orientation Weekend or prior to the beginning of the semester. An alternate day may be scheduled with the ensemble director. Contact the individual ensemble director for audition requirements.